With the proliferation of martial arts schools these days, it may come as a surprise to you that once-upon-a-time, not so long ago, if you looked in the telephone books of most cities and towns across the United States for a karate school you would not find one. And, if you looked in the Philadelphia phone book, you would find only one, the Shuto Karate Club. 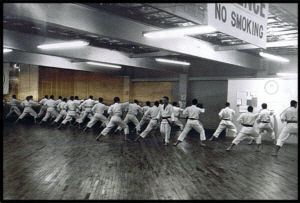 The Shuto Karate Club opened its doors at 119 W. Chelten Ave. in the Germantown section of Philadelphia in January of 1960 after its original home on Rising Sun Ave. was destroyed in a fire in 1959. 1959 was the year that Mr. Louis Rabouin moved to Philadelphia from New Orleans by way of San Francisco. Since 1950 this chemist, graduate of Tulane University, had studied with two oriental instructors in San Francisco’s China Town. One was Chinese, named Sen Chen who taught him a form of meditation designed to heighten the senses and control the "chi" (inner energy). The second was Japanese, named Tamaro Yoshida, (a student of Gichen Funakoshi, the father of modern karate) who taught him Shotokan style Karate. Louis Rabouin at the Shuto Karate Club was one of a handful of people teaching any kind of karate in the entire country at that time. He predated the arrival of the Japan Karate Association’s first official representative, T. Okazaki, in Philadelphia by nearly two years. In 1964 both Rabouin and Okazaki were profiled as karate pioneers in Black Belt Magazine on page 27. On Wednesday, September 8, 1926 the League of Nations formally admitted Germany as a member. the Philadelphia Phillies trailed the Brooklyn Dodgers 4 to 2 going into the bottom of the 9th inning, but rallied to win 8 to 4 on a Cy Williams grand slam. And, in New Orleans, Lousiana, Louis Rabouin was born. Young Louis had no burning interest in politics or baseball. He was a child of the depression with little money and his interests ran more toward roller skating and chemistry. In 1950 he graduated from Tulane University with a degree in chemistry. He immediately thereafter took a job as a trainer/supervisor for the Curtis Key & Machine Co. His new job required him to travel to cities throughout the U.S. The first city to which he was assigned was San Francisco. Due to gang activity in his neighborhood, the streets of San Francisco were a dangerous place in those days and Louis decided that he needed to learn how to defend himself. He headed down to China Town and enrolled in the dojo of Tamaro Yoshida, a Japanese karataka who was a member of the original Shotokan Dojo and had been trained in Japan by O'Sensei, Funakoshi Gichin, Funakoshi Yoshitaka and Obata Isao. Louis also began the study of a form of chi-gung with a Chinese Master named Sen Chen. Louis spent several hours every night in the dojo. His hard practice paid off, for, in just a few years he became one of the first non-Japanese Americans to be awarded a black belt in Shotokan style karate. In 1955 Louis was sent to work in Dallas Texas. There, away from his sensei, he devoted himself to another of his interests. He became a professional roller skater and dance skating instructor. By 1959 Louis, now a ni-dan, and the Curtis Key & Machine Company had parted ways. He was now living in Philadelphia, working as a chemist for Dupont Experimental Stn. in Wilmington, DE and the Penn Salt Co. in Wyndmore, PA. He took his earnings and rented a space above Sonny’s Cleaners at 4904 Rising Sun Ave. where he started the American Self Defense Karate Association; the first karate school in Philadelphia, and the first school of Shotokan karate on the east coast of the USA. 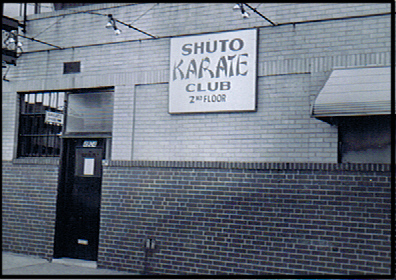 Later in the year, the school was given a new name: Shuto Karate Club. Early in 1960, a fire in Sonny’s Cleaners damaged the building and made it necessary to relocate the school. But, in less than a month Louis was back in business at a bigger and better location at 119 W. Chelten Ave. in the Germantown section of Philadelphia.